Welcome to a new article from Jordan Sadler based on using your fantasy premier league free hit. Probably the best time to use it would be for a blank week due to FA Cup postponements later in the season but some people may want to use it now for other reasons. The article may also help you for daily or weekly fantasy football choices. Just to remind you the free hit chip allows you to make unlimited free transfers for a single gameweek. 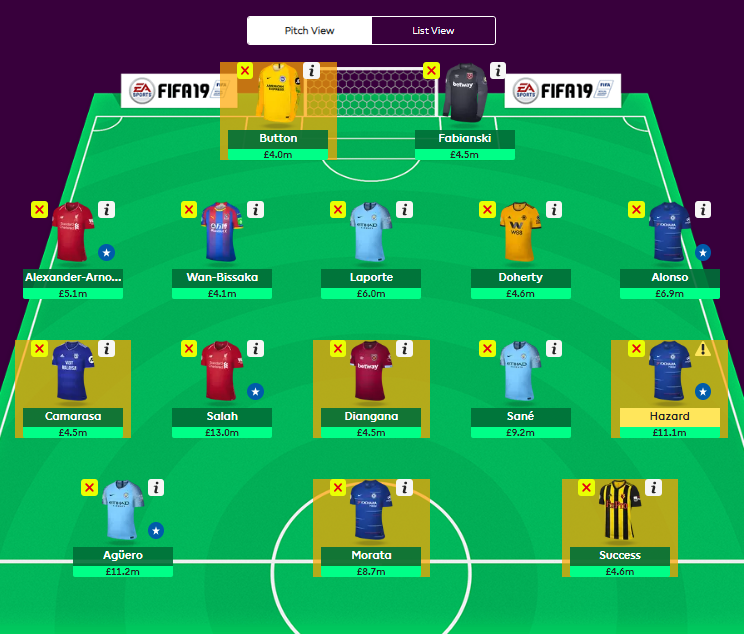 At the next deadline your squad is returned to how it was at the start of the gameweek. The Free Hit chip can be used once a season, is played when confirming your transfers and can’t be cancelled after it’s confirmed. When playing your Free Hit chip, any saved free transfers will be lost. You will be back to the usual 1 free transfer the following gameweek. Just like Geek I will most likely play my free hit chip during a blank gameweek later in the season. The article this week will be a bit more brief due to time constraints. The team value this week is very high at £103.2m so you may need to downgrade one or two players to fit it within your budget. The obvious choice is Alonso to Luiz which would free up £1.5m. The team is a a 5-3-2 with Camarasa, Diangana and Success as the subs. Fabianski in my opinion is one of the best non top 6 goalkeepers in the league alongside Dubravka and Patricio. He has a decent fixture this week playing away at Newcastle. He’s made the 2nd most saves in the league so far this year and is first for bonus for goalkeepers with 7. Fabianski will play therefore I feel there’s no point in wasting funds on a bench keeper. Alonso is currently the highest scoring defender in the game with 87 points. He’s got a great fixture at home versus Fulham this week so not only is there a good chance of a clean sheet but also a good chance of an attacking return also when we look at Fulham’s defensive record. Laporte is the only defender this season at Man City that has played every Premier League game and he’s the only outfield player in the team to play every single minute of the premier league season so far. Because of this I feel we can confidently say he’s pretty nailed in the squad and with Man City having a good home fixture versus Bournemouth I think a clean sheet for Laporte is a strong possibility. 25 points in his last two games and Liverpool host their Merseyside rivals this week at Anfield. I think Liverpool’s defence will be too much for Everton so I think a clean sheet is likely and looking at the last two weeks we may even see another attacking return from Trent as well. Disappointing returns from Doherty as of late with Wolves conceding 9 in their last 5 and Doherty only returning 6 points in that time. However, the underlying stats are still good from Wolves and Doherty so I still hold faith that he and Wolves will come good for us. Palace showed us last week versus Man United that they have a strong defence and so a game at home against a struggling side like Burnley is another great chance to show that. Wan-Bissaka is a steal at £4.2m so he makes the perfect cheap defender for this team. 4 goals and 2 assists in his last 5 games is a good return from Salah and he does slowly seem to be getting back into the relentless form of last season. Everton is never an easy fixture for Liverpool but I think if anyone gets a couple of goals against this weekend then Salah is most likely to be that man. With Fulham so defensively poor it’s the perfect fixture for Hazard to get back into the excellent form he started the season in. I could definitely see a couple of attacking returns from Hazard this week if not more and that is why I’d make him my captain. He returned 19 points last week against West Ham and every game he’s started this season so far he’s returned. He has a PP90 of 10.6 when starting games and every game Mendy has missed so far this season Sane has started so I think it’s highly likely he features a lot more now Mendy is out. In fact I think he’ll feature more than Sterling if I’m honest as Sane offers the width that City lack without Mendy. Just a cheap bench filler that will likely start. Has a decent fixture so I would make him my first sub. Another cheap bench filler that will start. Has an okay fixture so I would make him my second sub. Aguero at home seems to be a different animal to the one that plays away from home so fortunately this week he’s once again at home. With 7 goals and 6 assists in his 7 home games so far he’s perfect for that premium forward spot this week. A bit of a left field option (this was Geek’s pick so don’t blame me if it doesn’t work out) but Morata has a good fixture against Fulham at home and has been producing pretty good underlying stats this year of 0.66 xG so I could definitely see him returning this weekend. Just a cheap bench filler that probably will get you at least a point as I doubt he will start now Deeney is back but I’m confident he’ll come on. He would be my third sub for that reason. Hope this helps you if you do decide to do your free hit this week or for some daily/weekly fantasy picks. 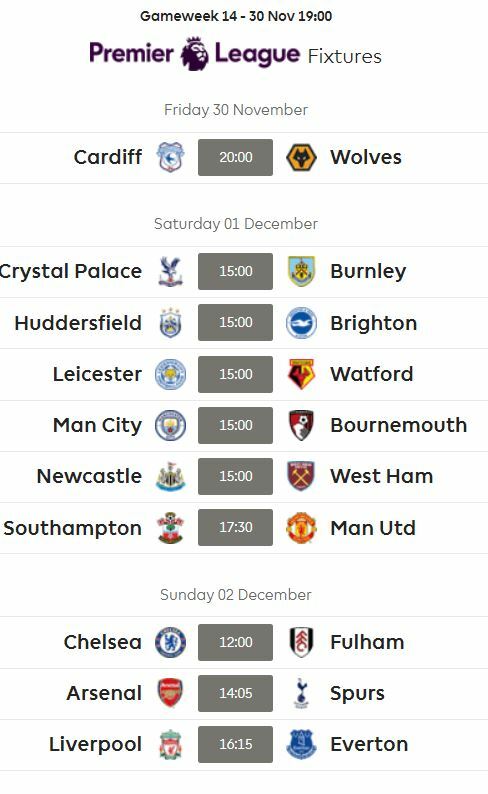 Good luck with gameweek 14.